There was a choice: Hire a car ("£270 including the excess insurance, sir"), which would have been convenient for the impending week in and around Glasgow and its nearby loch, or grit my teeth and embrace bicycles and buses. Thing is, Susan's already down there with a Toyota Corolla Verso (thanks, Jim), a double bass and several weans. We don't need two cars on the mainland, and besides, I'm not insured to drive the Toyota, which means that on any social evenings in the vicinity of the River Clyde, not to mention James's apearance with the National Children's Orchestra, I may be able to partake of a small libation.Now that the Atenolol is kicking in and my blood pressure is back to normal. Approximately. I bought my own blood pressure monitor (£12.99 off eBay) and oh, what fun it is to test oneself in varying circumstances (let's see...just back from seeing the excellent Spike Lee film - and it truly is a Spike Lee film, let no-one tell you otherwise - Inside Man, and it's shot up to 131 over 97, which is crap, actually; diastolic was down to 83 earlier on). Ah well. Anyway, I've hired a bicycle for dotting about to trains and buses down in the Great Corruption that is Glasgow. And tomorrow I do that Megabus thing (£8.50 return) to get out of Aberdeen. Which is damp and dreich, dreich, dreich at the moment, though yesterday evening (see picture of me via phone) was gorgeous, golden and heavy with the hope of spring. Yesterday was actually spent mostly in Elgin, Radio Scotland's current Soundtown. The show came from Elgin High School, and one of the school's several rock bands, Envoy, played live. 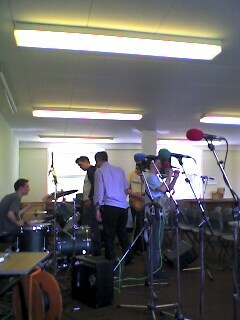 There's a snap here of the lads setting up. Cycling is something I've never quite stopped doing, and now I feel it's time, for many reasons, to commit myself to it as a mode of transport. One, it makes me feel good, and always has (something to do with that first, stabiliser-off lurch of freedom way back when); two, it'll help me get fit, and three, I'm planning a mammoth charity ride later in the year. This will be in aid of the Shetland CAT scanner appeal. All will be probably be revealed in due course. It's time to get rid of the motorbike and for that matter motorbiking. I thought having the Harley would be a kind of "mature" way of coping with that adolescent urge to get my motor running, head off on the single track highway. But frankly, it's stopped doing anything for me. But frighten the living the daylights out of me. True, pushbikes face dangers on the road too, but the statistics fairly and squarely convince: old men on motorbikes are accidents waiting to happen; old men on pushbikes (on Sustrans cycle routes) probably just have high blood pressure. And I'm sick of petroleum products.My carbon footprint is the size of a diesel elephant's. All of which will be hugely ironic if I get killed or maimed cycling around Glasgow next week. I'll try not to. We're into true late March Shetland weather now, severe gale nine winds gusting to who knows what, boats cancelled, power flickering off and then, thankfully, back on again. 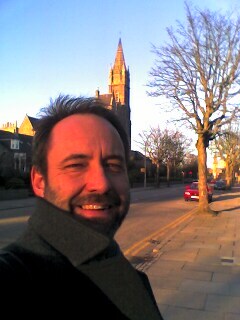 The snow has gone, but so has the stillness and sunshine of Thursday. Last nightit was hard to get to sleep for the perpetual swishing noise that signifies a really big wind, punctuated by enormous buffeting crunches and rattles from our (mostly, but not all)double glazed windows. Oh and we all remembered that today was mother's day. But we all forgot about the clocks going forward. This all reminds me of my previous life among premillenial dispensationalists, some of whom were sometimes caught out when the clocks went back, turning up at a closed and shuttered gospel hall to spend an agonising hour or so convinced that the Rapture had taken place without them. What a day! After all that moaning about the snow, what happens but the warmest day of the year, so far, but WITH SNOW! It's the first time in years I've seen the snow glittering. I was out and about earlier this morning, dressed in t-shirt and light pullover (yes, OK, and trousers) and I could feel the sun hot....well, warm...against my face. It's also flat calm. 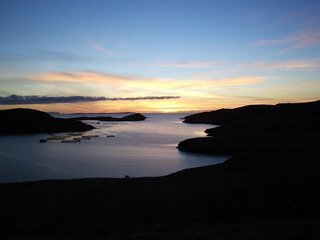 After the darkness and howling gales of the winter, it's just fantastic. 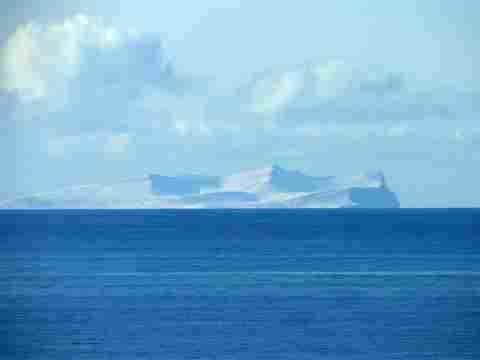 On a wee drive up to Eshaness, I saw Foula dressed in white for the first time ever. Foula being the most westerly Shetland island, allegedly the model for Tracy Island in Thunderbirds (only in the Caribbean, obviously) and identified by the Romans as Ultima thule, or the edge of the world. I've been there, and it's an extraordinary place, with the highest sheer sea cliff in Britain and some unsalvaged remnants of wartime aeroplane crashes. One of the geese has, for the past fortnight, been sitting on a clutch of eggs right in the middle of our Stonehenge/Callanish/Brodgar flower bed. She knows it's spring! Enough typing! I have blood pressure to reduce and snowmen to build. Oh, and work to do as well. Also golf clubs to clean and restore, but that's another story. I conducted a little experiment today: using a portable monitor, I measured my blood pressure at 3.00pm and after the show finished at 4.00pm. 202 over 120 and 193 over 128. Which is not good. Normal is...120 over 80. Don't ask me what those numbers actually mean. Well, actually, I can tell you what they mean: they mean, lose weight, stop drinking triple shot lattes, especially the ones with Calvados on the side. Also Mike's chocolate muffins. Salty things like...all my favourites. Bacon. Pickled herring. Smoked fish. And cheese. In my heart of hearts (and I come from a classic West of Scotland family with a history of stroke and heart disease) I know the cheese has always been a big problem. I mean, just passing Mellis the Magical Cheesemonger (there's one in Aberdeen, just down from the Beeb)is an exercise in temptation-avoidance. Did I mention my high cholestorol? Ah, but that's treated with daily statins'n'aspirins. Sort of. Spring, eh? Well, actually, I've experienced colder summer nights in Shetland...but this picture was taken almost three weeks ago, and subsequently we were hit by tonnes of snow and, over the past four days, ferocious winds gusting up to 95 mph. The snow was, of course, sheer delight for the St Bernards. 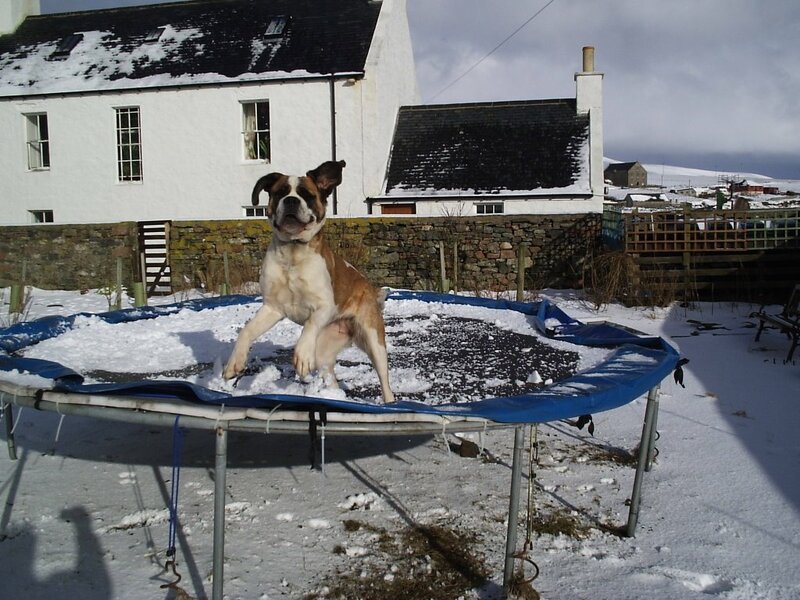 Lulu has a thing for the trampoline, anyway - she is the bounciest of St Bs - but combine that with snow and not even the prospect of digging out an avalanche survivor could interest her. Not that avalanches were a serious problem. ...help ma boab, etc. It was Oor Wullie's 70th birthday yesterday, and I seem to have spent most of the week being interviewed about it. There are/were features in The Scotsman, Daily Record, on Grampian TV, Reporting SCotland (BBC1) and on oor ain BBC Radio Scotland. Everyone's in a particular lather about the anti-Nazi strips during WW2 and the...ahem...supposition that writer and arist RD Low and Dudley D Watkins were on some kind of Nazi hit list. Yes well, maybe. Fact is that almost all cartoon strips during the war years contained some kind of propaganda - most notable perhaps the Superman/Green Lantern/Batman DC strips in America, where the superheroes actually went to war. It is a matter of record that Albert Barnes, wartime editor of the Dandy, and George Mooney, who ran the Beano WERE found to be on Nazi target lists, as a result of strips like "Adi and Hermy, the Nasty Nazis". This is being discussed today on BBC Radio Scotland's Radio Cafe (1.15pm) and tomorrow on the Fred MacAulay Show (around 10.00 am. 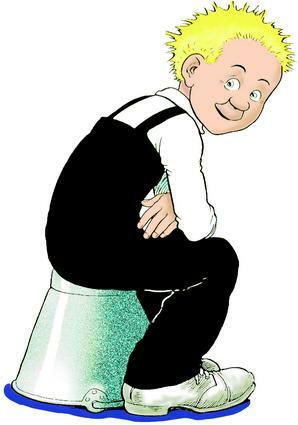 goodness knows what the Sunday blatts will do - though their enthusiasm for Oor Wullie may be curtailed by the annoying knowledge that Wullie's home, The Sunday Post, still sells a colossal 600,000 copies a week. One of the problems with blogging is knowing when to post and when to leave the deathless work of artistry you're so proud of in place for folk to....jeer at/admire/ponder the significance of/wonder if you've died. Seeing as I was sitting next to my boss, Mr Jeff Zycinski, today, and he was pointedly pointing out that this blog had not been updated for some time, I felt it was time to abandon Oor Wullie (check out the documentary, Friday, BBC1, 9.00pm) and deal with what's been happening. Snow has dominated all. I had to cancel two long-booked teaching engagements, first with assorted primary schoolchildren in Lerwick (all the Shetland schools were closed last week) and then last Friday with secondary pupils in Fortrose. In the end, I did manage to fight my way through the white stuff to Lerwick on Thursday, though only by the skin of my non-winterised, too-wide tyres. That meant I caught the ferry south on Thursday night. It was my son Magnus's 18th birthday, hence the impetus to leave the Zetlandics. Arriving in Aberdeen, though, I wondered if I'd ever reach Glasgow. The place was knee-deep in snow, with more falling, and the streets gridlocked. I walked, (no hope of a taxi in this city with the worst cab availability in Europe)to the BBC through a blizzard and, bizarrely, a full-on lightning storm. There seemed litle hope of getting away by Megabus (£15 return) to Glasgow, though in the end, that's exactly what I did. Megabus, Magbus tells me, offers fares as low as £1 if you book early enough. It's all a Stagecoach operation, which means Citylink is part of the group and you're as likely to find yourself on a Citylink coach as on one of those garishly-painted Megabus double deckers. I quite enjoyed it - somehow it's not as tiring as rail travel, though I've no explanation why that should be the case. Passengers were polite to each other in a way I haven't noticed on trains - the young lass next to me, before implanting her iPod Nano earphones in her lugs, earnestly asked me to tell her if I was being disturbed by sonic overspill. You never get that when Scottish Exec execs are shouting the odds and stumbling to you in Scotrail first class (£1 upgrade at weekends). Anyway, the Sandyford as usual, meal with Mag, Walk the Line (belatedly; it was wonderful) and Syriana (impressive, but tricky to follow. Clooney is great but not as great as Christopher Plummer). Then whoosh, back up on the bus and into Aberdeen. A man with a head severely shaven'n'scarred sat ahead of me and talked incessantly, entertainingly and obscenely on his mobile, systematically sorting out what seemed like a turbulent personal life. No ventilation and it was stiflingly hot. 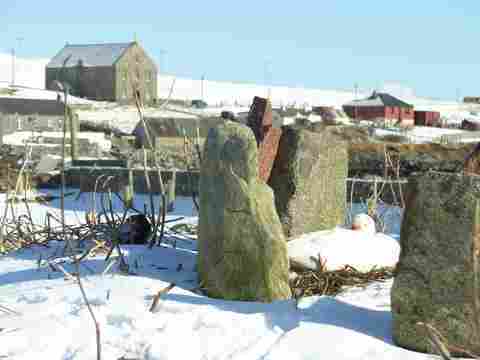 The snow was on the wane in Castle Greyskull, but not in Shetland, where they were being deluged with the stuff. No power cuts, my wife told me, so that was something. People were ski-ing and snowboarding just up from our house. But what do they do with the skis the rest of the year? Anyway, last night Jeff Z and I ate at Cafe 52, which The Herald has declared something like 12th best restaurant in Scotland, and in which I have eaten superbly in the past. Not last night. It was OK, but the food was over-spiced, and chilli-laden Cullen Skink frankly I can do without. A disappointment. Also annoying that Beans, that handily-late-opening coffee bar on Union St, was shut, but there was, fortunately, the excellent Under the Hammer to repair to. Today the snow is turning black, and it looks like all the schools in Shetland will re-open tomorrow. Hopefully by Friday, when I get the boat home, it will be spring.